In the recent year you have been showered with free cloud storage anyone can use to store files online, any types of files so you can easily access them anywhere on any devices. These are great so you can practically put aside your worries of not being able to complete your projects or tasks in case you are away from your device. But since many of you are using Gmail and utilizing Google Docs at most, now Google also ready to serve your needs with its cloud storage ‘Drive‘. Previously Google Docs, Google Drive is another cloud storage you can use to store your files on the cloud and access anywhere across devices. If you are familiar with Google Docs, you will be able to start using Google Drive, and you get to conveniently edit 30 different types of files without having to install software on our own devices. Google is giving away 5GB of free storage on Google Drive, and you can increase the size starting at only $2.49 a month for 25GB. We will get through some features and walk you through with guides to use your Google Drive so you can start using it today. To get started, go to Google Drive official page and get access to your free 5 GB storage. Once registered, go to the download page to install Google Drive client on your Mac, PC and Android devices. iOS users will have to wait until the app is ready. 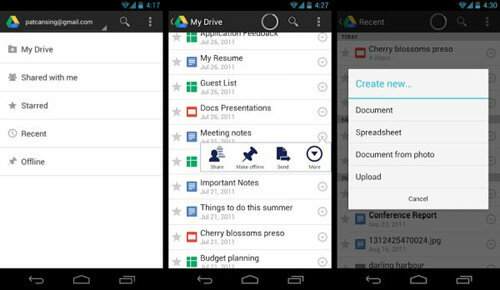 Google Drive on your Android will allow you to view documents and share them with anyone. 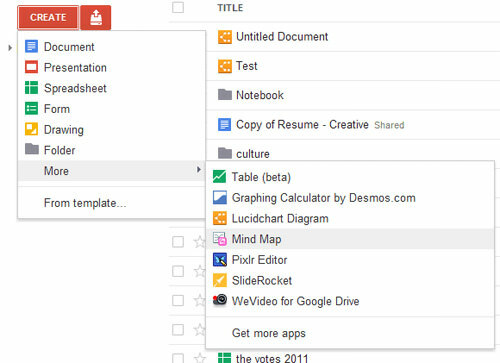 You can also create new Google formatted files including Documents and Spreadsheet. 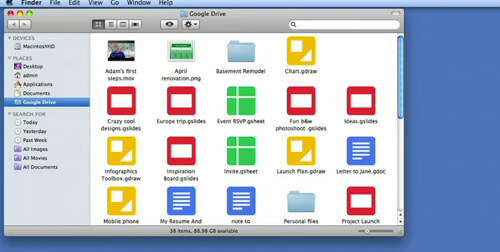 Google Drive for your Mac has similar features to Dropbox, with relevant options when you click on the icon. And the folder view too. If you are familiar with Google Docs, then it will be easier to get around with your Google Drive since all sharing, drag-drop and comment features are also available for your Google Drive. To share a file, simply point your mouse to the file, right-click and select ‘Share’. Main menu is always at the left-hand side, and the view is similar to your Google Docs. But with the new Google Drive, you can change the view to ‘grid’ from the top menu. Google Drive on the web has search bar at the top of the page that also integrated with Google Goggles, and with this search, you can easily find your files by defining the type of files, or search based on text contains in a document or even photos and PDF files. 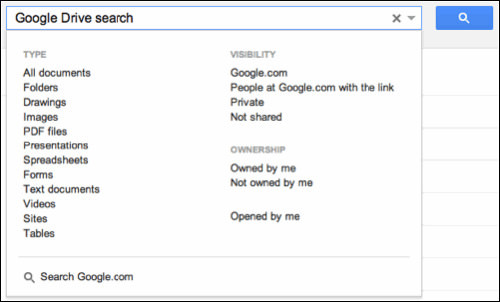 Simply type any keyword and Google will list all relevant result based on your files on Google Drive. Now with Google Drive, you can edit many types of files among others including AutoCAD, on the go from your Chrome browser without having to install specific software on your computer. To be able to edit various file types, Google has prepared Google Drive’ Chrome extension page just for this purpose, so head over to the page and install required extensions to your Chrome browser. Not having to install specific software on your computer also means that you can only edit files on your Chrome browser, and connected to the Internet. Google Drive now allows you not only to edit many different types of files, but also to create new ones right from the cloud. To create new file, click on the red ‘Create’ button on the left menu and select the file types you want to create. Select ‘More’ if you want to create file other than Google formatted document, and you will have more selection once you installed more extension for your Chrome. To be able to access your files from Google Drive when you are offline, make sure you download Google Drive client for your Mac, PC or Android. There are however some limitations when you are using Google Drive, knowing Google has its own formatted file types known as Google documents, spreadsheet, presentation, forms and drawings. You can open non-Google Docs files, view and edit them offline, provided you have the specific software installed on your computer following file types. You can view, but editing is disabled for Google documents and spreadsheet. You can’t view Google presentations, forms and drawings while offline. When you edit files offline, changes will be sync automatically when you connect your device to the Internet and Google will place a time stamp for your reference. Launch Chrome and go to Google Drive homepage. 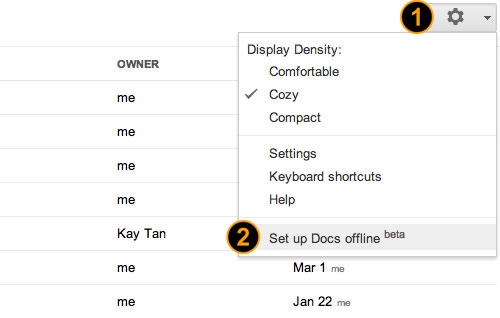 Click the gear dropdown at the top right corner of the page and select Set up Docs offline. In the dialog window that appears, select Allow offline docs. 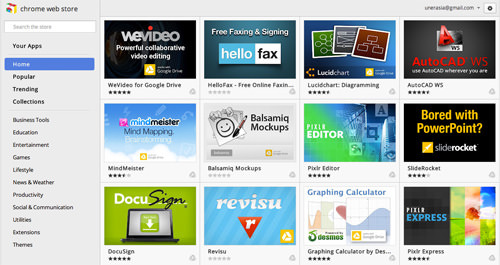 Click Install from Chrome web store. Click Add to chrome to install from Chrome extension page to your browser. Now when you click open Google documents or spreadsheet while offline, it will be open in a new tab on your Chrome browser. You can access the file but you will not be able to edit. 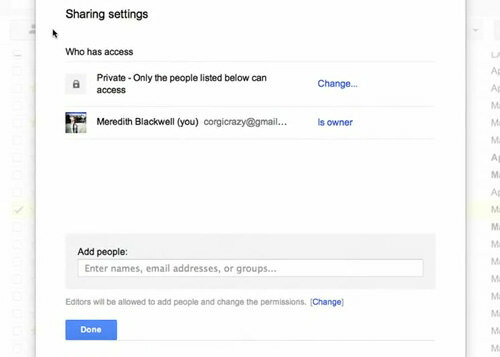 Although the arrival of Google Drive is late, it is still beneficial for many, considering the usage of Google Docs, which previously you can only access on the web, now you can access them locally on your computer. Also, with more file types supported by Google Drive, it will be much easier for you to work anywhere on any devices since you can now edit 30 different file types from your Chrome browser. Knowing Google Drive is the cheapest in the market in comparison with many other players, perhaps there’s some catch, what do you think?